By his own count, Ivan Drury has plastered up more than 50,000 posters in Vancouver over the last 15 years. At one point, he wanted to launch a constitutional challenge against the City of Vancouver's anti-postering bylaws. His efforts to get stopped back then failed: he had his wheatpaste confiscated, or the posters taken away, but even when he plastered up a poster in front of a watching cop, there was no ticket. 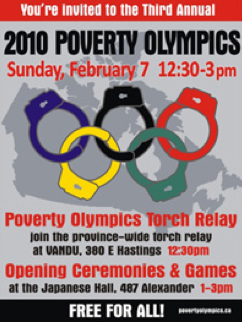 That changed last Thursday, when Drury was postering for the Poverty Olympics at the corner of Hastings Street and Caroll Street in Vancouver's Downtown East Side. In this 4 minute clip, Drury explains how he was ticketed and how the police explained his actions.